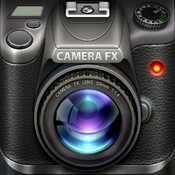 This is the time of day in the App Store: Camera FX, FX Pro Camera and Camera FX for iPad. Quite a good opportunity for lovers of photo retouching. And today we can only download these applications very full image retouching totally free for iPhone, iPad and iPod Touch. Gift from the App Store. Instagram style, we can take pictures from within the application, apply filters and retouching, and share our social networking profiles such as Twitter or Facebook. This is a very complete and good in performance that we recommend not to miss if you have not yet downloaded. Free only today!